Athena Giles came to the circus through the circus club at Hampshire College and Show Circus Studio in Massachusetts. Since then, she has trained around MA, a brief stint in New Zealand, and most recently in Chicago. Her natural habitat is in the air or in her garden with her dog. 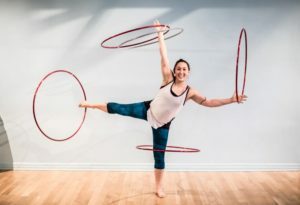 Athena’s specialties are hula hoop, lyra, and stilting.